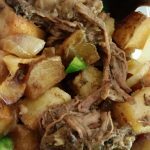 The question of what to do with leftover pot roast comes up often enough in my household that I thought it would be a good idea to share some of the yummy solutions I have come up with in the past. In the fall and winter months I typically make a roast about once a month or so. Thankfully we always have the delicious leftovers to play with. Sometimes I am feeling super lazy and we just eat the leftovers as roast a second time, but other times I want to get more creative. 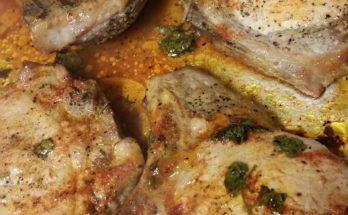 Most of the time I cook a beef pot roast, but all of these suggestions also work great with pork roasts. So, without further ado, lets get on with what to do with your left over roast. This is a favorite in my house. These are super easy and fun to make, and of course wonderful to eat. Just in case you aren’t familiar with taquitos and flautas, they are basically the same thing. The difference is that taquitos are made with corn tortillas and flautas are made with flour tortillas. It is truly amazing how much this once thing changes the flavor. Both are delicious, but totally different. Since we love both of them, we almost always end up making both. Making both actually makes it seem more like a full meal, due to having more than one taste to savor. And then you add the appropriate condiments, and you are looking at a plethora of flavor explosions. The concept behind either of these could really not be more simple. You take some shredded meat and roll it up in a tortilla and fry it in oil. That’s really all there is to it. The only variables are the heat of your oil and keeping them from unraveling. If you have a deep fryer or a fry daddy type thing, then you are probably an expert on these. But for the rest of us we cook them in a frying pan. A lot of recipes for fried items call for a ton of oil, but I am a penny pincher and try to get away with the least amount of cost as possible. I use canola oil. It is better for you than some other oils, and I don’t like the taste of vegetable oil sometimes. Instead of filling your pan with an inch or two of oil to completely cover the taquitos (or flautas), you really only need to cover them half way. You just need to flip them to save money, and have less waste. Shred up your leftover meat. It should be easy if you have a well cooked roast. Put the meat in your tortillas. The amount of meat you put in each tortilla is really up to preference, but you want to make sure you don’t put in too much. You want to be able to roll the tortilla around the filling enough to have the far edge of the tortilla come back over the first edge as far as possible. If you did the previous step properly you should now be able to stick a toothpick in the rolled meat tortilla (corn or flour) and seal it up. Get your oil hot. Use about half an inch or so. As I mentioned, you want it to cover half of your rolled and filled tortillas.Just as with everything I deep fry in a pan, I get the oil to the point of being able to flick water off my finger tips into the oil that results in quick pop and sizzle. On a heat dial of 0 to 10, put it on 7 or 8. The temperature drops when you add food. If it seems too hot or too cool adjust appropriately. The goal is to fry quick without burning. Ok, you are ready to go! Now you want to place 3-4 taquitos, or 2-3 flautas in your pan. Never overfill the pan. 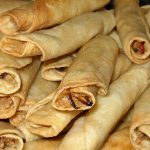 Each rolled tortilla needs to be surrounded by oil, not touching another taquito (or flauta). You may need to adjust your heat at first if they seem to be burning, or not frying fast and hard. Barely cooking in oil is not good. They will end up with soggy, chewy, and oil saturated. It is very important to have the oil hot enough. In my opinion, a little too hot is better than not hot enough. You have a toothpick to deal with, so you will be flipping from side to side of that toothpick. Believe me, the slight inconvenience of the toothpick is totally worth not having your taquito flay open. It will take about 3-5 per batch. When the tortillas look evenly cooked on every side they are done. It happens really fast. Not a lot of mystery here. They look done, they are done. Set them on some paper towels to soak up any excess oil. I love condiments! We like to have some sour cream, guacamole, and salsa to add to this delicious meal. Personally, I like to take all kinds of different flavor combinations of bites. One with just guacamole, one with just sour cream, one with both, etc. I will also have a compliment of different hot sauces at my disposal. For me every bite is different until I find the perfect one. 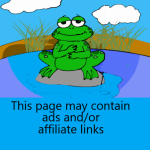 As you know, if you have spent any time on this website, I love hot sauce! This is one of those meals that I usually end up going to my fall back hot sauce of Tabasco. There are other super delicious options though. One I would highly recommend for taquitos or flautas is Marie Sharp’s Habanero. This is a really great hot sauce. Good flavor, but not overpowering, with a nice spice level. It is best to make enchiladas when you have quite a bit leftover meat. As opposed to the taquitos, you only need to have the edges of the tortilla barely overlap. 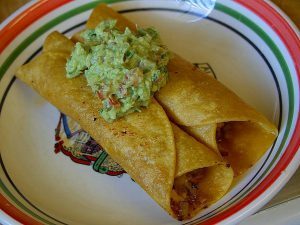 Taquitos are “rolled tacos”, and enchiladas tend to be looser with more filling, and in a bigger tortilla. Traditional enchiladas use corn tortillas, but in our house we prefer flour tortillas. Corn tortillas stay a little more firm, which some people prefer. I just think flour tastes better, but you can use which ever you like best. Or you can always try a few of both, which I always recommend. Enchiladas are fun to experiment with. There are so many possibilities. You can use different fillings, sauces, and as I mentioned before, tortillas. This recipe will be describing what you need, and how to make our favorite version of enchiladas. These are really pretty easy and straight forward to prepare. Take your shredded meat, sour cream, green chilies, and a third of your shredded cheese, and stir together in a bowl. Take filling and put in tortilla. You should be able to roll the tortilla enough that one side flaps over the other. Then put flap side down in your pan. Continue doing this until your pan is full, or you run out of meat. 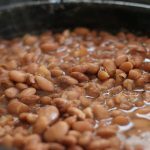 We like to do half of our batch with pinto beans added to the meat and half without, just to mix up the flavors some. Feel free to try this. It also makes your meat go further if you are running a little short. After you have all your tortillas lined up side by side in your pan, pour on the Verde Sauce. The tortillas will soak up a lot of the sauce, so don’t be stingy, just pour it on. Then put the rest of your cheddar cheese on top. Have your oven preheated to 350 degrees. All the ingredients in this dish are already cooked, so basically you are just heating it up and melting the cheese. This should take about 25 minutes. You can very easily just add finely chopped chili peppers to your filling mix. 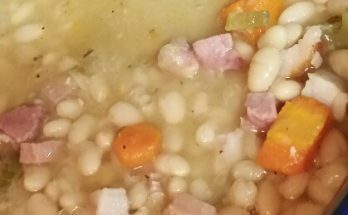 Jalapenos, habaneros, or whatever your favorite hot pepper is would be a great spicy addition to this tasty concoction. This is a new favorite of in my house. Poutine isn’t super popular in the United States for some reason, but a recent trip to Vancouver, Canada showed us what we were missing. Now we try to convert everything we can into poutine. The possibilities here are really endless. 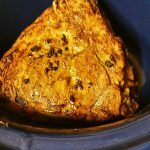 I plan to do an article later just focusing on this addictive meal, but I wanted to give a brief explanation here of how to easily convert your leftover pot roast into this special treat. Your leftover pot roast no doubt leaves you with some delicious shredded meat, and hopefully some flavorful juices and drippings too. Today I am sharing this super easy way to make Poutine. There are definitely fancier ways to go about this, but generally I am all about tasty, quick meal ideas. If you choose to use frozen french fries, go ahead and follow the instructions on the bag and get them cooking. They generally take about 25 mins. This will give you time to make your gravy while the fries cook. You can also cut up potatoes and fry them like breakfast potatoes if you would prefer. I have done it both ways, and either works great. 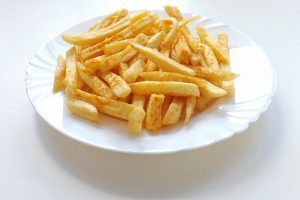 I use frozen french fries when I am feeling to lazy to make my own potatoes. No matter what potato option you choose, go ahead and get your starch cooking and then work on the gravy. Any favorite brown gravy recipe will work here in a pinch. I have tried several types of gravy for my Poutine. You can see my schnitzel gravy recipe for a super rich and flavorful option. The last time I made this dish I actually just used the drippings from the roast I made with some leftover tough chuck steak I had. I took the shredded pieces and the delicious au jus they were soaked in and poured that directly on my french fries. Traditionally this dish calls for cheese curds. If you have some or would like to buy some from your local grocer I recommend them, but they can be kind of pricey. I have used little chunks of cheddar when I don’t have cheese curds, and it worked just fine. I haven’t tried it, but I think mozzarella, feta, or whatever cheese you have handy would also work just fine and give your dish a unique flavor profile. You will also want to heat up your meat prior to serving. You can do this in the microwave or give them a quick fry in a pan. If you are using shreds that are in your drippings instead of making a gravy, just heat them up at the same time. I also like to add a little chopped jalapeno. It gives it a nice spice and adds some color. You are all set to go. 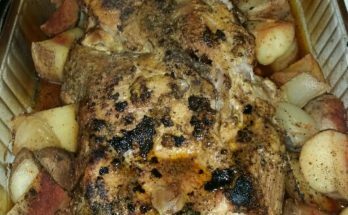 Just put the potatoes or fries in a bowl or on a plate, put your shredded meat and cheese curds on, and pour on the gravy. Eat while still hot and enjoy! These three options should totally solve your leftover pot roast dilemma. You can even stretch out your leftovers and make Taquitos one night and Poutine the next! 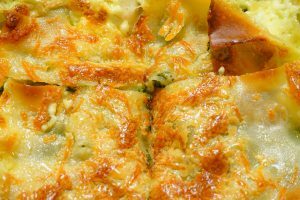 Leftovers are really wonderful for giving you some easy to make flavorful dishes for the days to follow. I always try to get a roast that is way bigger than I need just so that we can indulge in a delicious variety of meals for days to come. I hope you have enjoyed the ideas provided here. If you have any questions, comments, or suggestions please feel free to drop us a line. You can leave a comment below or reach out through our contact form. Previous Article Does Spicy Food Boost Your Metabolism?